hen you're giving a report or presentation on the Wright brothers, there are few things more impressive than having a model of the Wright Flyer on hand to help illustrate the points you're making. This is especially true if you've built the model yourself. The trick is getting the right model kit. 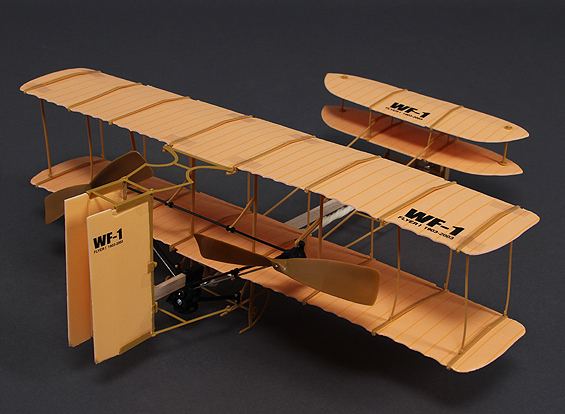 There are a lot of Wright Flyer kits out there, and some are better suited for presentations than others. EASY BUILT MODELS (Wood) – If you need a static (non-flying) model, Easy Built Models offers two detailed balsa-wood-and-tissue-paper kits for a model with a 24-inch wingspan (about 1:20 scale). These are absolutely the best kits for demonstrations and presentations for the simple reason that they are built exactly like the Wright Flyer was built (only somewhat smaller, of course.) You can point out the ribs, spars, struts, rudder, elevator, engine, propellers – all the major parts on the model match the parts on the real thing. If you want to add even more detail, you can consult the plans we've included below. An experienced modeler can, in fact, build this up to be a museum quality Flyer model with some extra research and effort. Another feature that recommends this model are the detailed, illustrated instructions that come with it. There are dozens of color photographs that show you just what to do, step by step. The kits also includes full-size templates for the subassemblies (wings, skids, elevator, and so on). You simply tack the templates to a board, then glue the subassemblies together right over the templates. The combination of detailed instructions and full-size templates makes the construction relatively easy, even for first-time and inexperienced modelers. The only thing thing we thought the kits lacked was a good rigging plan. The plan provided is not just basic, it's inaccurate. And it makes no attempt to distinguish between rigging and control wires. But it's an easy fix – download the measured drawings offered below and use them to rig the model. Both kits will result in exactly the same model; the difference is how the wooden parts are delivered. The less expensive kit provides balsa wood with the parts printed on the wood. You must cut them out yourself, a time-consuming task. The more expensive kit provides the balsa wood with the parts already laser-cut, saving you a good deal of tedious work. However, you must sand the burned marks from the lasered surfaces, which is also a tedious task. Builders often submit photos of their completed models (both laser-cut and printed), and Easy Built shows these on their web site. This model was built by Thomas Havens from the kit with printed parts. The engine and cockpit area of this laser-cut kit show some wonderful details that were added by the builder, Andrew Sanchez. You'll find many more photos from builders on the Easy Built Models web site. GUILLOW'S MODELS (Wood) – Guillow's also offers a laser-cut balsa wood model similar to the model offered by Easy Built. It's the same size (24-inch wingspan), the same level of complexity, and nearly the same price. Guillow's also provides paper templates for accurate glue-ups. However, the resulting model is not quite as detailed as the Easy Built model, and the instructions for building it are not as comprehensive. It does , however, offer two things that the Easy Built model does not -- a display stand and a laser-cut silhouette of Orville flying the airplane. 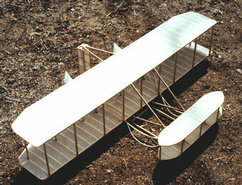 Check out Guillow's 1903 Wright Flyer model here. You can see over a dozen photos of the Guillow's Flyer in progress at the Guillow Model Builders' Forum. At the Virtual Aerodrome, you can see dozens of photos of completed Guillow's 1903 Wright Flyer models. 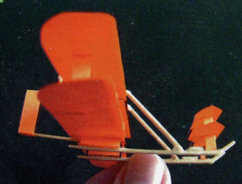 Guillow's Wright Flyer model comes with a stand and a silhouette of Orville in the cockpit. 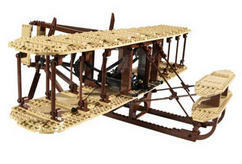 LEGO (Plastic) – While it's no longer being manufactured, it's worth noting that Lego once offered a Wright Flyer kit. It wasn't what you could call an accurate model. With all the bumps and holes in the wings, Wilbur and Orville would have had a hard time keeping it aloft. But it had the definite shape of a Wright Flyer. And it offered one amazingly accurate detail that no other static models have duplicated before or since. The struts were hinged to the wings in the same way that the Wright brothers joined their struts and wings. This makes it possible to warp the wings of the Lego Wright Flyer. Too cool. Our bowlers are off to the Lego modelers. Although you can no longer purchase this Lego kit commercially, they do come up for auction every so often on Ebay. 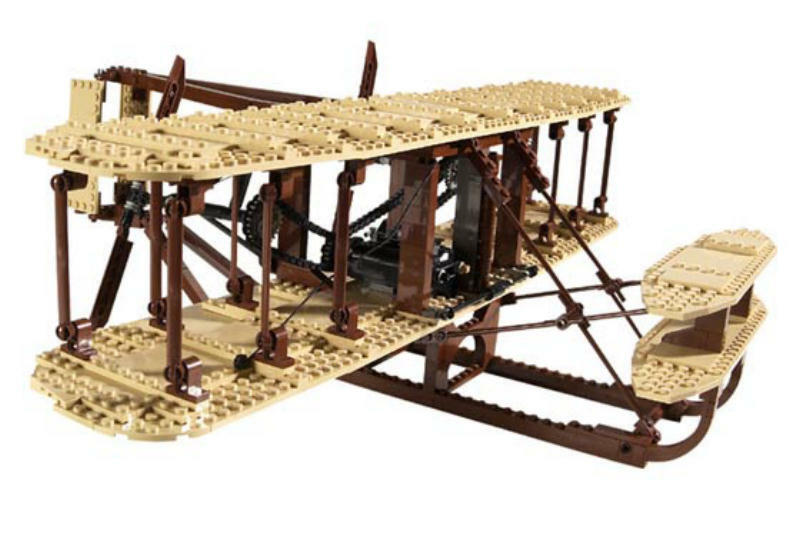 Lego made this Wright Flyer kit available briefly for the Centennial of Flight in 2003. 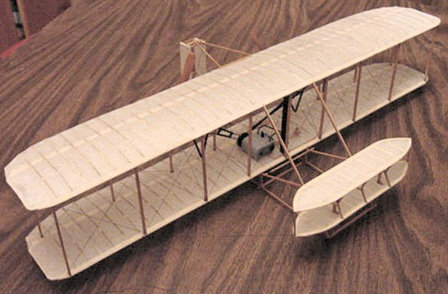 MODEL AIRWAYS (Wood and Metal) – If you're looking to build a museum-quality 1903 Wright Flyer model, Model Airways offers the most accurate kit that we have yet examined. The wooden parts are laser-cut from balsa wood and most of the metal parts are etched from brass, all in striking detail. The kit includes assembly jigs and full-size paper templates for accurate glue-ups, as well as a 28-page illustrated booklet with step-by-step instructions. The resulting model is 1:16 scale with a 30-inch wingspan and 15 inches from nose to tail. 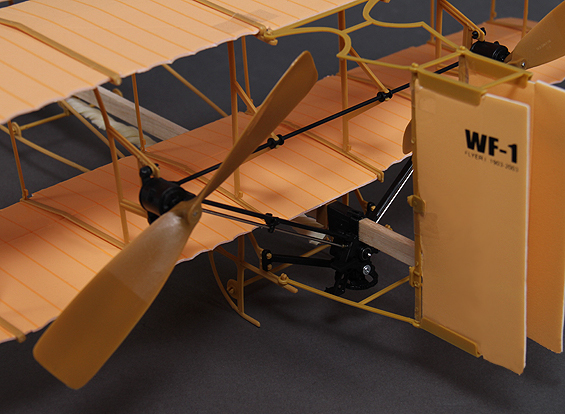 Unlike other model kits, Model Airways does not provide a wing coverings. They suggest you leave the model uncovered to show off the construction details. You might also leave one half of each wing and control surface uncovered to give the viewer an idea of how the completed Flyer looked without hiding the details. If you prefer to cover all or half the surfaces, you can buy coverings such as tissue, silk, Silkspan and Koverall from most modeling suppliers. For all their attention to detail, it's surprising that Model Airways let slip one minor inaccuracy. The ribs on the canard (front elevator) supplied by Model Airways are cambered (curved). On the actual Wright Flyer, they were straight. Wilbur and Orville designed the canard so that when the elevator surfaces were pitched up, the ribs flexed and developed a positive camber (producing positive lift). When pitched down, the ribs flexed in the opposite direction, developing a negative camber (and negative lift). Fortunately, it's an easy fix -- just discard the cambered ribs and substitute straight pieces of balsa wood. 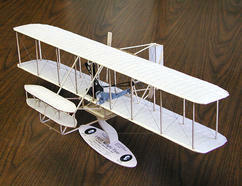 You can purchase the Model Airways Wright Flyer kit from several suppliers, including Model Expo. So you know what you're getting yourself into, click here to review a PDF copy of the Model Airways Wright Flyer instruction manual. 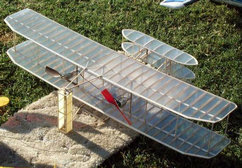 A completed Model Airways Wright Flyer model by Robert Byrnes. Lee Herron built this Model Airways Flyer for a diorama, but decided to cover the wings. You can see the details of his amazing display HERE. REVELL (Plastic) – Revell (formally Revell Monogram) offers a detailed plastic 1/39 scale model Wright Flyer, with a wingspan of just over 12 inches. It's not as impressive as the Easy Built or Guillow's models, nor does it's construction mirror the real Flyer. For example, you cannot point out the ribs and the spars in the wings -- they are just sheets of molded plastic. But it is a good deal simpler to build than a balsa-wood-and-tissue-paper models, and it's less expensive. It also offers a launch track, figures of Orville and Wilbur, and some of the tools that were laying around in the sand that you can see in the famous photograph taken of the first flight. You cannot buy these models directly from Revell, but you can find them at many hobby suppliers on the Internet. We suggest you try Scale Hobbyist first, since they carry a large inventory of historic models. If they are out-of-stock, google "Revell Flyer Model." or search Ebay. 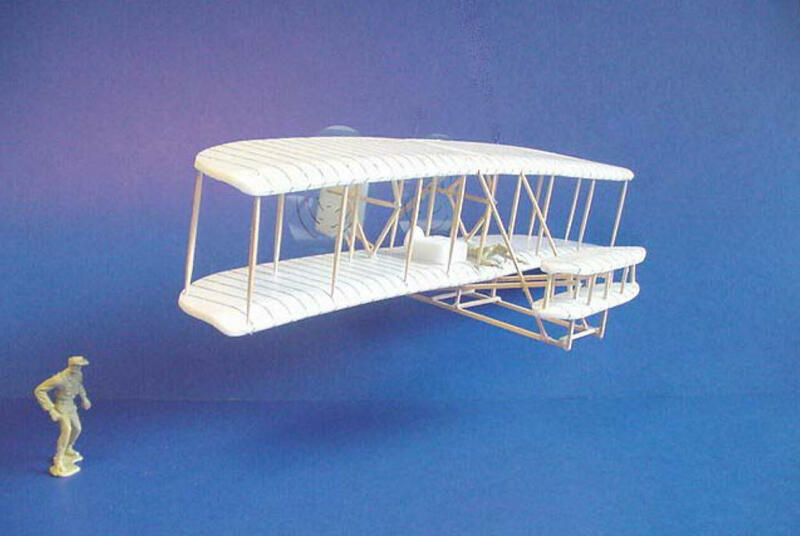 Note: As of this writing (December 2014), the Revell models of the Wright Flyer are in stock at Scale Hobbyist. To get to the order page, click HERE. The Revell plastic Flyer model, assembled and painted. 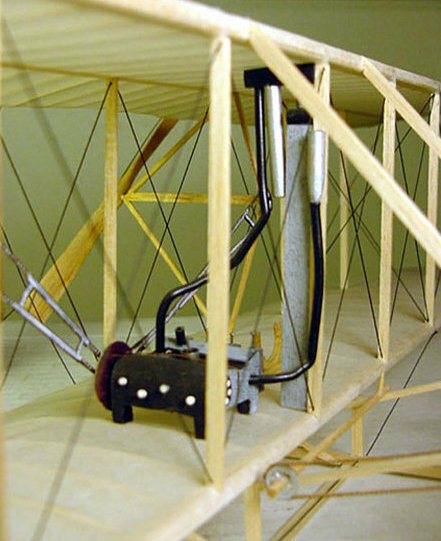 RC and Rubber-Band – By far, the best and most detailed flying models of the Wright Flyer are offered by Brodak of Carmichaels, PA. Brodak sells two laser-cut model kits for the 1903 Wright Flyer, each with a different power source. These flying models were developed by Pat Tritle, a veteran model-designer with talent and tenacity the would make Will and Orv envious. 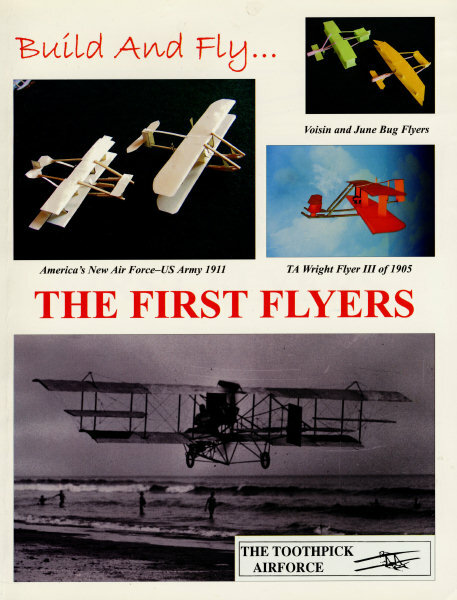 Pat has graciously contributed a page to our web site that describes how he developed the RC Flyer. To read Pat's piece, click HERE. 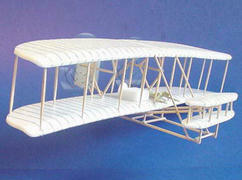 If you would like to see one of Pat Tritle's RC Wright Flyer in flight, click HERE. And if you'd like to visit his personal web site, you can find it HERE. Pat Tritle's radio-controlled model of the 1903 Wright Flyer. 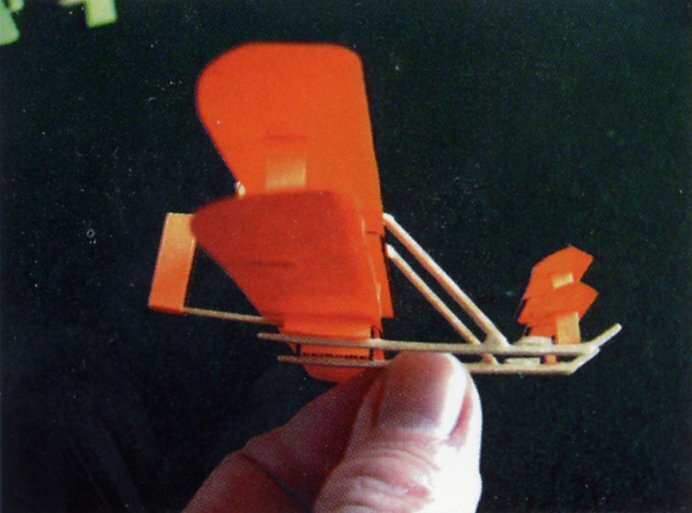 Rubber-Band – This rubber band-powered Flyer model is made by Lyonaeec, a manufacturer of almost-ready-to-fly airplanes. It was designed by Dr. Danny H. Y. Li, who flew it at the Wright Brothers National Memorial in Kitty Hawk, NC, for 350 feet (106.6 meters) -- almost three times the length of the first flight on 17 December 1903! The model is made from plastic and structural foam parts that snap together to make an airplane with a 19-inch (490 mm) wingspan. A single rubber band turns a gear-drive "engine," which in turn spins two contra-rotating props. To launch the model, you simply wind up the rubber band with a handy ratchet winder, then press a lever at the back of the model to release the torsion and start the propellers. While it doesn't look as historically accurate as other models you can buy, it's ingenious, easy to build, and flies surprisingly well. You can see a video of Dr. Li flying his "WF-1" model at the Wright Memorial HERE. You can purchase the Lyonaeec WF-1 Wright Flyer rubber band-powered model from Hobbyking International. 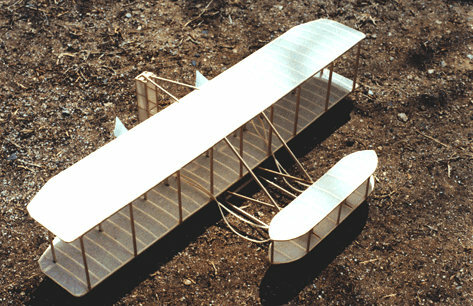 A rear view of the WF-1 rubber band-powered Wright Flyer. A close up of the WF-1's propellers and "engine." Rob has also recreated toothpick versions of two of the Wrights' experimental airplanes, the 1902 glider and the 1903 Flyer. You can demonstrate the invention of the airplane – or the entire history of pioneer aviation – using his models. 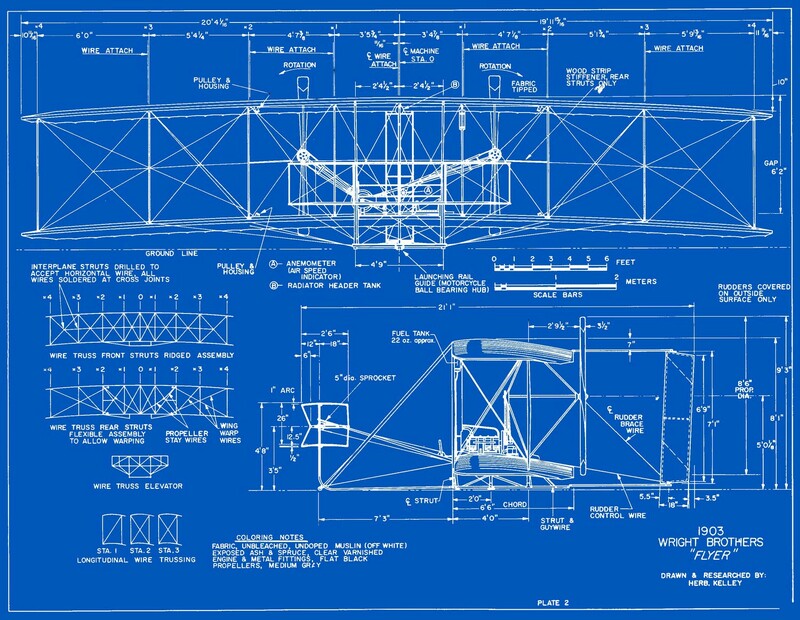 Rob thoughtfully collected the plans for his experimental Wright aircraft, plus instructions and tip for building and flying the models, for the Centennial of Flight in 2003. You can get a copy in PDF format right HERE. By the way, "Booger Red" was a slang term for "undertaker" in the American West where Rob lives. 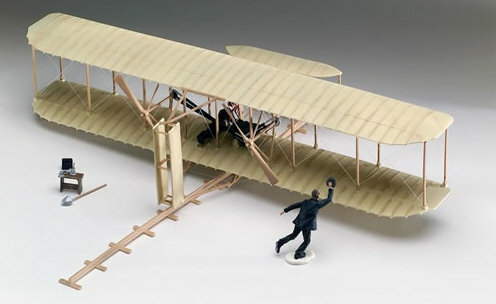 The Toothpick Airforce's 1903 Wright Flyer. Rob has also written The Toothpick Air Force, which contain plans for both historic and modern tiny aircraft replicas..
NASA – One of the best plans we've seen for a simple, scratch-built 1903 Wright Flyer model was developed by Roger Storm at the NASA Glenn Research Center. Roger used foam meat trays for the wings and control surfaces, toothpicks for most of the wooden parts, and the little bit of balsa wood for the longer wooden parts. You can also substitute bamboo skewers for these long parts, making it possible to pick up everything you need to build this Flyer at a grocery store! Despite the humble materials, however, this is a remarkably accurate model. And you can make it even more accurate by using the plans we've included in this section to add rigging and other details. 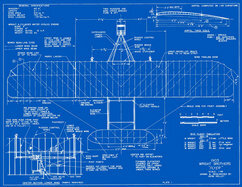 Download the NASA's Wright Flyer Model Plans and Templates in PDF format. In addition to building the Flyer, Roger also shows you how to make Orville and Wilbur figurines from plastic soldiers. 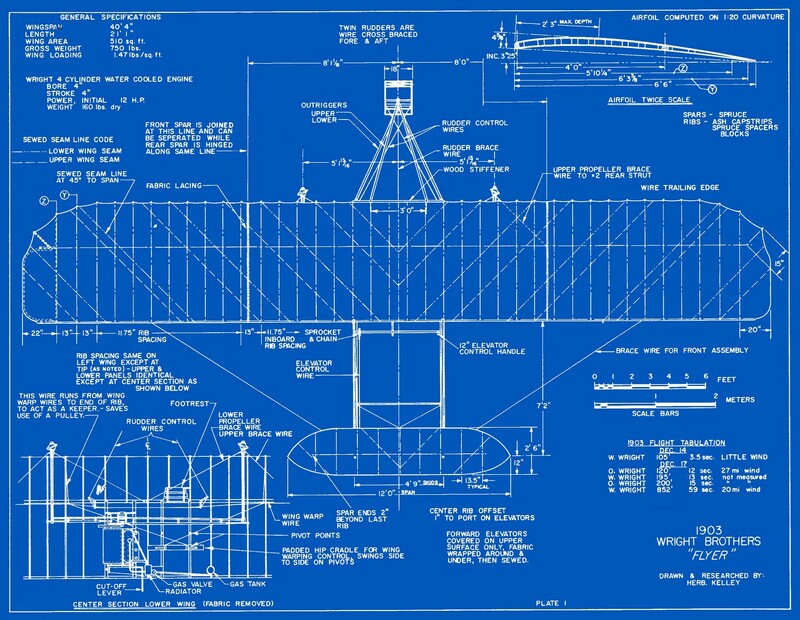 Plans – If you want to design and build your own model from scratch, you'll need a set of measured drawings. You may also need these drawings if you want to add detail or accuracy to a model, whether scratch-built or made from a commercial kit. Heck, you may just need a set of plans for research or to satisfy your own curiosity. The plans to the right should answer those needs. Left-click on the thumbnail and wait for the large image to load. Then right-click on the large image and choose "Save Image As" from the drop-down menu that appears. 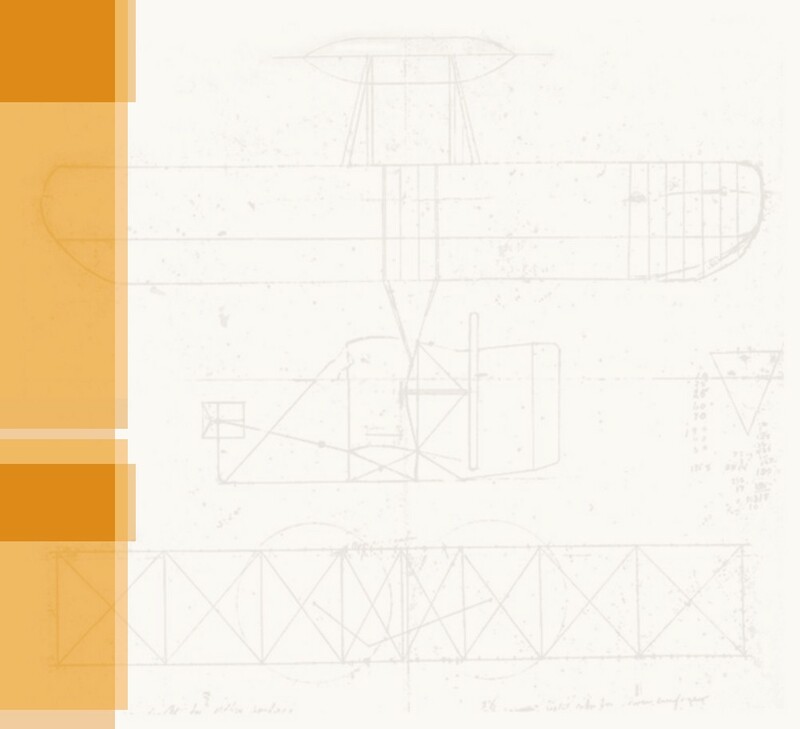 Depending on the amount of detail you want to add to your model, consider downloading our virtual Wright Flyer model, available as a 3D PDF in the Virtual Models section below. There's only so much information we can pack into two sheets of plans, but our virtual model shows the shape and location of every part. You'll also find it an excellent reference for rigging the Flyer. We show every wire, both structural and control cables. To better see them, click on "Model Render Mode" at the top of the screen – the icon is a green box superimposed over a blue box. Choose "Solid Outline" from the drop-down menu. 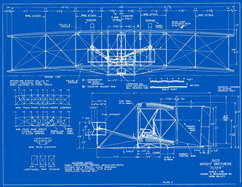 Measured drawings of the 1903 Wright Flyer, Plate 1 (top view). Measured drawings of the 1903 Wright Flyer, Plate 2 (front and side views). 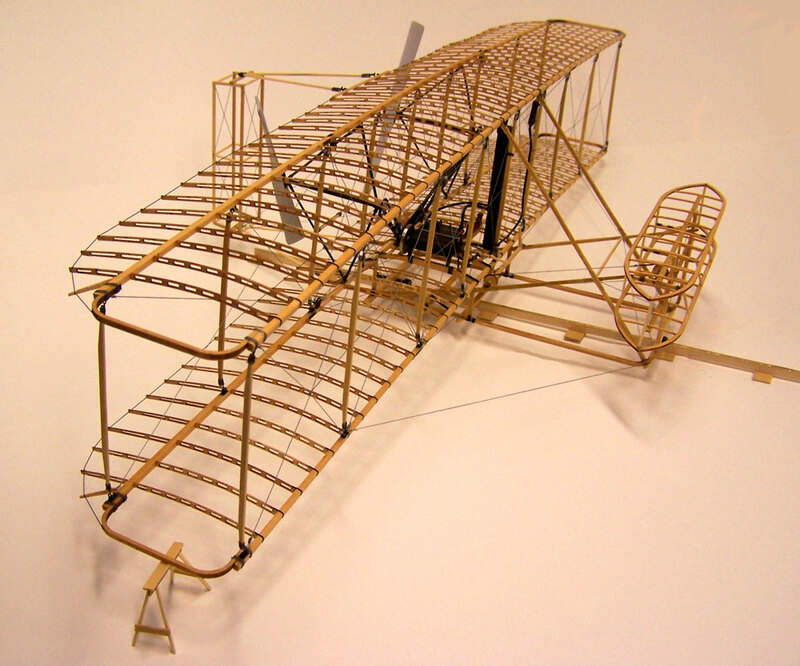 If you aren't the hands-on sort that enjoys building physical models, maybe you'd like a virtual model of the Wright Flyer I for your report or project. If you poke around the web, you can find digital Flyer models in several different languages and formats, including VRML (Virtual Reality Mark-up Language), X3D, 3D Studio, Autodesk, and many others. To see these on screen, you must either have the program in which the model was created or a viewer which will read that particular format. Viewers allow you to manipulate the model on screen, turning, panning, and zooming into to see details, but you will not be able to append or change the model in any way. There are a few free digital Flyer models available, but most cost money. If you don't mind paying, visit CGTrader – this website offers digital models for sale from $25 to $200. Generally, the higher the price the more detailed the model. If historical accuracy is important, be cautious. Check out the details against the plans we have provided in the Scratch-Built section. If you'd rather stick to free, you can download a modestly detailed virtual model of the Flyer for no cost that can be manipulated in Sketchup. This is a three-dimensional drawing program used to build architectural and engineering models. Trimble, Sketchup's parent company, let's you download the program and use it free for 30 days. This allows you to add details and labels, even make artistic renderings of the Flyer if you want to take the time to learn the program. Or, if you'd rather not modify the file, you can simply view and demonstrate the 3D Flyer model with a free copy of Sketchup Viewer. 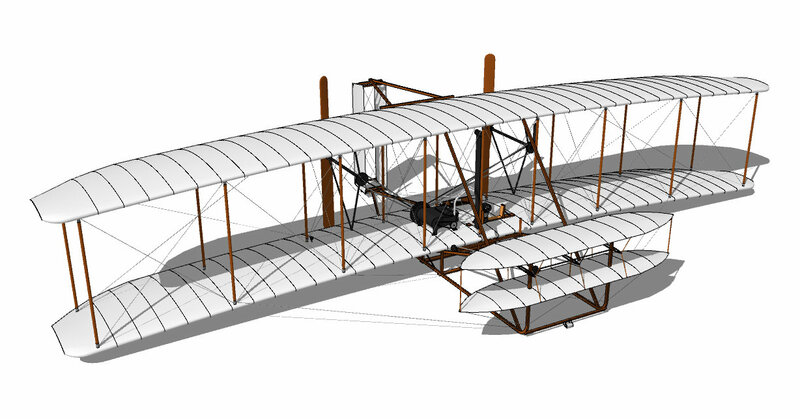 ►Click here to download a zipped copy of the Sketchup Wright Flyer (663K). ►Want to see a detailed digital model of the Flyer from any angle? CLICK HERE to download the WBAC Wright Flyer I 3D PDF (about 11.8 Mb). (Your browser must have an up-to-date Adobe Reader plug-in to view the model.) After loading the PDF file, choose "Enable all features" to display the Flyer and the viewing tool bar.